A few of my latest posts were on the topic of industrial saison from the beginning of the 1900s (see this recipe with an infusion mash and this recipe with a turbid mash), and I'm returning to that topic here with a recipe from 1911. This recipe shares some similarities with the 1905 recipes, but what I find interesting about this recipe & why I am writing it up in addition to the other recipes is that this recipe seems geared toward a younger, less aged saison. I'll get into this in more detail in the post, but to begin with the recipe includes more of a focus on late addition hops and it mentions an optional cutting of the beer with lambic. Cutting (coupage in French) is something I want to return to in detail in a post to come. But for now check out these great posts from Amos at Browne & Bitter with coupage backgorund and some modern examples using this technique. The begining of the article - a Q&A for brewing a saison year-round. I'll present the recipe as it appears in the text, followed by an adaptation of the recipe to fill in some holes and alter it for more modern conditions. After all this I'll compare the recipe to other contemporaneous saison recipes I've written up and close with some thoughts on this recipe as fitting between other circa 1900 saisons and modern saisons. -50/50 mix of French malt and Dikili malt. The recipe notes the French malt could be substituted for Escourgeon, depending on the season of brewing (the brewer specifies that this beer will be a year-round bottled product). In the latter case, the mash would start a bit cooler. Escourgeon is a winter 6 row barley that was common in Belgium at the time, and I’ve discussed this grain in the 1905 saison posts as well as posts about Bière de Garde. Mash in with water at 70-72° C (158-161.6° F) at 2 L/kg (~1 qt/lb) to reach a rest of 61° C (~142° F). Rest for 15 min and then underlet with 95° C (203° F) water to reach 70° C (158° F). A time isn't given for this latter step. No information is given regarding fermentation (e.g. pitching rates, temperature). The beer is then clarified and clear beer is racked into barrels with 200 g East Kent hops per HL of beer (0.44 lb hops per 26.4 gal beer). The journal notes a minimum resting time of 2-3 weeks here. An advertisement for lambic for blending from Petit Journal du Brasseur 1922. This is geared toward homebrew batch sizes, but this is easily adaptable to pro sizes with the original text and whatever modifications you wish. I'll give my reasoning for assumptions, modifications and/or additions to the original recipe. Target OG: 1.048 (I think ~1.045-1.050 would be good. No OG is given in this recipe, but this is reasonable for saison of the time, with bias toward quicker turnaround beers). Approximate IBU: 33.5 (theoretical, Tinseth) - I think the apparent bitterness would be higher than this given that this is derived from higher doses of low alpha hops, and that the dry hop is not adding any bitterness according to the calculator I used. I haven’t brewed this, so this is simply a draft recipe as a starting point for you to work with based on other beers I’ve made and some changes I would make to this recipe to modernize it. If you do brew something like this, I’d love to hear your feedback on the recipe you use. Personally, I would lean toward the 100% malt option. As with the other saison recipes, I think a malt such as a continental European pale malt would be a good one to try. For 19 L at 75% total efficiency, you would need 4 kg (8.8 lb) of malt. You could optionally replace 400 g of this with about 240 g of sugar (or even a larger percentage of the malt with a proportionally larger amount of sugar), but I think the all malt recipe might give a more interesting beer. This mashing schedule is pretty straightforward and I think it can be left generally as is. The 70° C (158° F) step could probably be lowered a bit (a lot of Belgian mash tuns from around this time weren’t good at holding their heat, so the mash could easily lower a few degrees C over an hour rest). And the 61° C (~142° F) step could extended as you wish. Especially for smaller batch sizes, the effective rest time at 61° C will be much shorter since the time to get the mash at this temperature is much shorter. So maybe 25 minutes at 61° C followed by 45 minutes at 68-70° C (154.4-158° F). There is no mashout specified in this recipe, but you can add one if you wish. That would be reasonable with Belgian brewing at the time. Based on the high SA:volume ratios of homebrew setups, I think this boil could probably be shortened to 90 minutes or 60 minutes for homebrew scaled beers while still keeping the spirit of the recipe and much of the characteristics of the beer contributed by the boil. Keeping the boil 2-3 hours on commercial systems may be better for following the recipe closer, but the boil seems to be less important in this beer than other recipes for Saison from the time. I wrote a good deal about the considerations I took when trying to adjust hopping rates in old recipes (especially here). Landrace Belgian varieties of hops are nearly gone and tricky to source, but landrace hops from the other regions mentioned are still readily available so the hopping rates here may not need to be adjusted down as far. Still, it may be good to lower the bittering hops and/or choose low aa varieties (e.g. Strisselspalt), and possibly to lower the other hops slightly. Here is an amended hopping schedule for the boil, with the above-mentioned hop modernization adjustments and with some assumptions about batch size to convert to hops per volume units. I did not scale the hops down as much as I had in previous recipes, in part because of the varieties specified here. I used an assumption of 110 g (3.9 oz) total boil hops (the ratio of 3 kg hops per 100 kg grist in the original recipe would give 120 g hops in this scaled recipe). If your hops are stronger than the numbers below you could reduce the amounts (especially with hops earlier in the process) or stick to these numbers and see how it goes. After primary, the beer would be dry hopped at about 2 g/L (0.27 oz/gal) with East Kent Goldings. This dry hop would last the duration of the aging (so about 2 months). Depending on how long you intend to age, you might want to transfer to a new vessel. I think on homebrew scales, for 2 month aging after primary and with a mixed culture, it would be fine to not transfer it. I think anything from roughly 2-6 months grain to glass could fit, but personally I think I’d lean on the shorter end of this range for this beer. Roughly 3 months seems reasonable to me as a starting point. Given this time frame, if you have a mixed culture that gives fairly rapid attenuation and is good flavor-wise by 2-3 months then that would be good here. But otherwise it might be advantageous to use a more constrained mix of microbes and/or a pure culture. Other aspects of this recipe seem to point toward this being less acidic/vinous than other saisons of the time. from Petit Journal du Brasseur, 1924. For the coupage component, this 1911 recipe does not specify how much lambic to use to cut the saison. The journal notes that the brewer would know best whether or not coupage would be a good idea as the brewer knows the taste preferences of their customers. Presuming you wanted to cut this beer with an aged, complex, acidic beer, the Petit journal du Brasseur provides some ideas in other articles from the late 1800 and early 1900s. 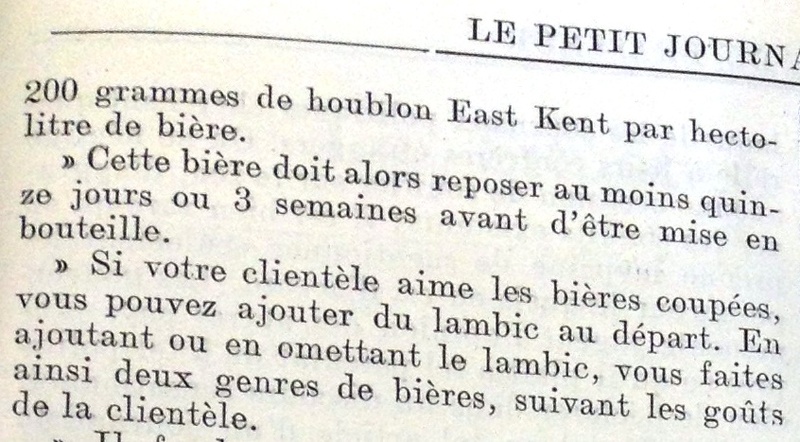 An article from 1914 suggests to start with 5-6% lambic and work up from there, considering the taste preferences of the customers. 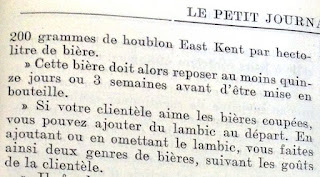 An article from 1902 recommends using between 1% and 10% lambic pre-fermentation. And finally an article from 1898 recommends using 2-3% lambic pre-fermentation for an artificial aging effect. The dry hopping recommended here would give a long contact time. I’ve seen suggestions along this line in other recipes and it isn’t something I had looked into much to get an idea how widespread it is and how it is generally accepted. Personally I would have said to lean away from such a long dry hop time but I wanted to get some input from others so I asked the Milk the Funk group. There were plenty of people there who had done long dry hops as in this recipe and were happy with the results (including some experienced home brewers that I trust as well as some professionals making good beer). So I think a long dry hop as in this recipe could work out fine from a flavor point of view. More importantly, the discussion highlighted to me something that I had underappreciated - the antimicrobial influence of the dry hop. I think including dry hops may be as much (or more) for preserving the beer from bacteria as for the direct flavor impact. This microbial control, as I'll get to below, makes me think this beer was intended for earlier consumption than some other saisons of this time period. Thanks to those who shared their experience in the MTF thread, and especially to Dan, Topher and Tommie for their thoughts/experience on the impact of hops here for continued antimicrobial protection. The greater focus on high quality hops (German, Czech and English) and the greater focus on later hops in the 1911 recipe would both result in more hop character, which would obviously result in considerably different beers. All recipes are 100% malted barley (though the 1911 recipe optionally includes some sugar). Much like the hopping information, the uniformity here supports industrial saison around 1900 was a 100% barley beer, or at least that this was regularly the case. As discussed above, the grist suggestions also make sense for a beer that may see less aging. Both of the 1905 recipes recommend 100% Escourgeon. This 1911 recipe suggests either 50% French malt (the barley isn’t specified, but I would guess a spring 6-row based on Belgian barley growing at the time and the absence of the winter 6-row specification) or 50% Escourgeon. The remainder appears to be a Turkish malt. Additionally, if the 1911 beer was meant to be aged for less than 3 months, the recipe would optionally include 10-15% sugar. From everything I’ve seen, Escourgeon was the recommended grain for beers meant for aging at this time. aging time, and the option of coupage with lambic. The mash outlined here is much more simple than most Belgian mashes I’ve seen for the time, especially for beers for aging. Even comparing to many modern Belgian brewers this saison mash is quite simple. The specific recipe presented in this 1911 article seems to be geared toward a saison that wouldn’t see as much aging as others of the time. I say this in part due to the hopping (more late hops, the dry hopping) and the malt, as discussed above. Additionally, the boil was shorter here and long boils were thought to benefit beers for longer aging. This 1911 recipe even puts additional emphasis on only boiling 3 hours, suggesting it was shorter than typical or what other brewers might expect. And the recipe mentions optional coupage with lambic. If this beer were going to be aged longer and allowed to acidify, then cutting it with a beer which had developed aged, vinous and acidic character would not be necessary or especially advantageous. But it seems here that the journal is providing this option as a way to add some aged character to the beer. Finally this 1911 response gives two slightly different recipes (with and without sugar) depending on if the beer will be aged for more than 3 months or not. In comparison, the brewer for one of the 1905 questions notes a 5-6 month aging period and the other wants to brew somewhere around March (estimating the timing the question was submitted based on the time of the published response) for a beer to be served in August. So, from what I’ve seen in terms of hopping, process and specific aging times suggested, this 1911 recipe sits on the younger end of circa-1900 industrial saison and would likely produce a beer with comparatively more hop flavor. As such, when I’m looking at old recipes, this is what I keep in mind as a “hoppier” (more hop flavor, not necessarily more bitterness) saison from ~1900 rather a more vinous, longer-aged saison. Perhaps this difference puts this recipe somewhere between a traditional historic acidic & vinous saison which had been aged 6+ months and the modern, more microbially pure, young and hoppy saisons.